Bread has a long and interesting history and I don't mean just at my house. It's been around for thousands of years in various forms and it's one of the foods that is found in every culture. I'm one of the people who really likes bread. I would be terribly disappointed if something happened that prevented me from eating a bit of bread at least once a day. It's interesting that such a simple food can occur in such variety. Unless you get fancy, for a leavened bread there are six basic ingredients: flour, water, salt, oil, yeast and sugar. Mix them together in a certain way and they make magic. This recipe is called "Crusty French Bread" and that's how it turned out. It's pretty good — I like it better very lightly toasted. It seems to bring out a bit more flavour. But is is crusty and it has a nice chewy texture. It's the first time I've made this particular recipe. 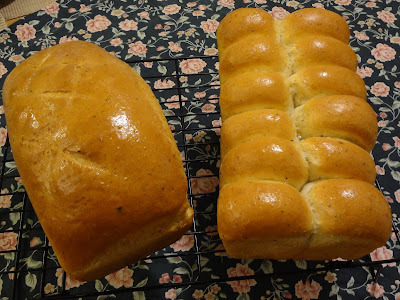 I have most often made what we think of in our culture as a "traditional" bread — but of course in every culture, the go-to bread is "traditional" as far as they're concerned. I've written about bread before — right here and I went into more detail about this very bread and its history with me. Another bread I occasionally make is Chef Chuck Hughes no-knead bread. It's fast and delicious and sometimes, that's just what we're looking for. I probably wouldn't have taken a photo except one of the most recent times I made this bread, it came out looking like a pound cake. It's one of the breads that turns our differently every time you make it. I don't know why. Atmospheric conditions? We only eat bread with a certain kind of meal but I do enjoy a piece of toast with my morning coffee and the occasional sandwich. I do like to think of it as the staff of life. *From The Walrus and The Carpenter by Lewis Carroll.